Okay, maybe it is. It’s getting yourself to do one thing when you’d rather do another, not matter how you look at it. BUT what I so often see is people are all or nothing with it. They are either doing it or not doing it. They are on a diet or not on a diet — and there is no in between. Once a cookie crosses the lips, you need to start all over. It’s true, isn’t it? Haven’t you experienced it? We’ve all been there at one time or another. 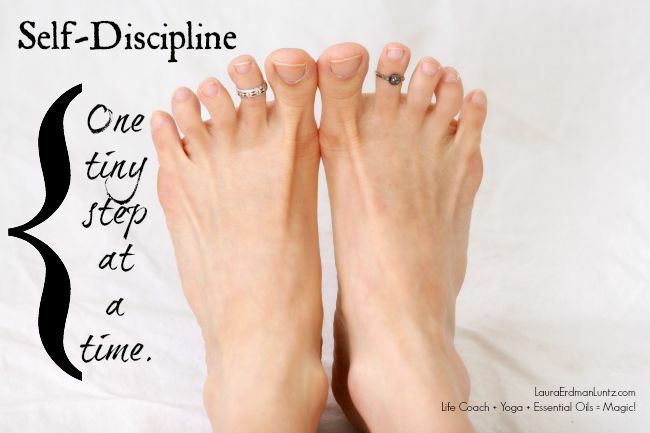 Are you struggling with discipline somewhere in your life. (I think most of us are!) You want to do something and just can’t get it started. Or you get started only to fall back to the old way a bit too quickly. What if you just did one small thing – just one – that got you closer to your goal. Whether it is a new habit you want to instill or something new you want to create for your life, choose something really bite-sized that you can commit to doing. Want to lose weight? Commit to drinking a bit more water each day for a week. Want to quit your job and work for yourself? Choose one hour a week to work on the new idea. Want to exercise? Commit to one after work walk a week. Want to reconnect to your spouse? Commit to one date a month. Not only will that one little change make a big difference over the long haul, that one change helps shore up your resolve and make the next step even easier. Have a starting time and the “next step” time planned ahead of time. Of course, decide when you will begin – otherwise you won’t. But also decide when you are going to add another bite-sized piece to it. You’ll never quit your job and work for yourself when you are only working one hour a week. But once the one hour is easy, you can add another hour. If you don’t bookend it, it is too easy to keep going in the status quo without changing anything more. We forget, get caught up in the day-liness of life. Actually write in your calendar when you are going to add another step. And, voila! Before you know it you will be doing what you want to be doing!